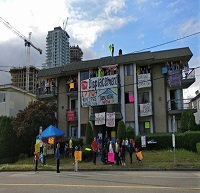 Burnaby is fighting mass gentrification in the metrotown neighbourhood through grassroots resistance including public meetings, protests and occupations. Stuart interviews Zoe about the many myths and prejudices surrounding issues of poverty and homelessness. How hard it is to survive on minimum wage jobs in an urban center and what barriers working class people face to get ahead. We examine a new way to look at work and possible solutions for the future. This entry was posted in Uncategorized and tagged another world is possible, be the media, borders, Burnaby, capitalism, community, Crack Capitalism, Demovictions, dispatches, global news, how to listen, Illegal, In the Fields of the North, international, internet, interviews, itunes, John Holloway, Latin America, latin waves media, media, media democracy, membership, migration, movements, Nato, No one is Illegal, passion, Peace, podcaster search engine, Podcasting, political, politics, radio, social change, sound, Stuart Richardson, Sylvia Richardson, Zoe Luba. Bookmark the permalink.